Pakistan’s first science, technology Innovation and educational internet television in near future which will cover science and technology educational activities in addition to popularizing the science and technology subjects through disseminating the relevant information and latest progress to students and common people. 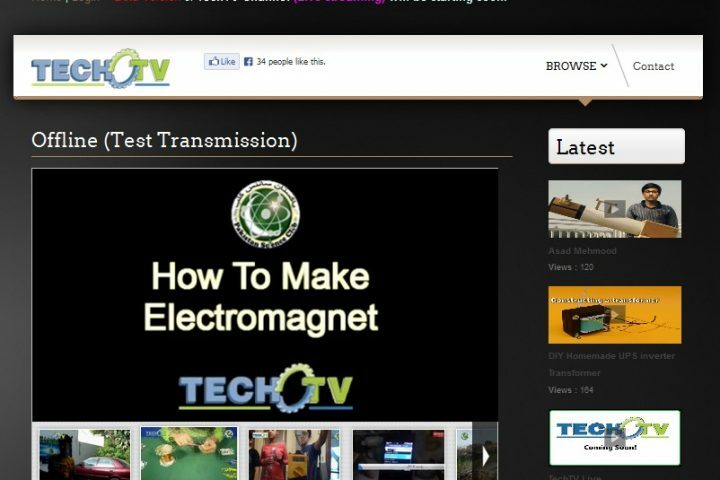 The project named TechTV.pk, a joint initiative of the Pakistan Science Club has recently started its beta version and after its full launch it would substantially contribute in delivering the diverse viewers and visitors to keep them abreast with the latest progress and researches in the relevant fields. This television channel can prove to be very useful, easy to access at anytime from anywhere and users can access a significant amount of information with reference to any topic in a short time and regardless of geographic barriers, allowing them to consult different point of views as well as hands-on experience through different DIY (do it yourself) projects. “Main objective of this web TV is to promote scientific culture and the youth’s interest in science, technology and innovations. The channel would also popularize science for laymen and students, seeking to cultivate the spirit of scientific inquiry and the love of learning in its audience,” said Abdul Rauf, President Pakistan Science Club (PSC) while talking to this scribe on the occasion of the soft launch of the web TV. He explained that the channel will use interactive and innovative programmes for this purpose. It will complement formal education try to inspire the youth to pursue careers in science. TechTV.Pk will cover all events from Pakistan related to science and technology educational activities. It will also offer free online courses of web application development, DIY projects, project management and other science and technology topics,” explained Ali Mustafa Zaidi Paras, while giving details of their project to this scribe. This is the most cost effective and easiest way to learn about anything; whether science, technology, innovations, engineering, education, and etc. It is best source of information for any field of study and research. He said that this channel would go a long way in setting the revolutionary trends in science and technology education sector through information technology. “It will also promote scientific research and technology in society, and encourage Pakistani youth interest in science, technology and innovation,” he maintained. Sayyed Paras was of the strong belief that after the full launch of TechTV.pk, would soon find a comfortable position in the science and technology universities, colleges, other related institutions as well as government departments as it has the potential to cater the multiple requirements of those seeking information and guidelines about their relevant fields. According to him, the awareness level of students and layman in Pakistan about science and technology is the too much low which needs to be improved and this channel would popularize science for those seeking to cultivate the spirit of scientific inquiry and the love of learning in its audience. Experts term this initiative as a positive step towards popularizing the science and technology activities in Pakistan, where this sector is set to go for a full takeoff. While science and technology academicians say educational television can educate masses on hygiene, literacy, child care and farming methods or on any topic related to day to day happenings.